Dennis Cieri, the NYC Independent Film Festival executive director and founder says, “it’s the indie filmmakers who change the nature of cinematography, as an industry and an art.” For this eighth year, Cierti’s crew assembled 85 judges to rate 1,278 films. It’s a gargantuan effort but if just one director, screenwriter, cinematographer or actor can move hearts and minds, it’s worth it. 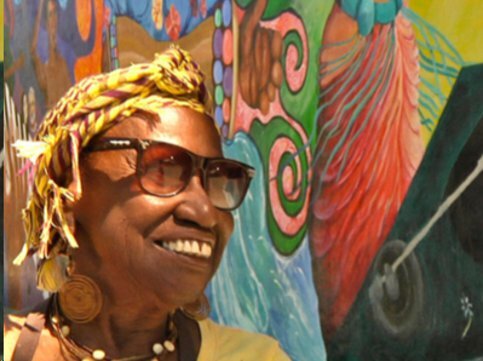 A New Color:The Art of Being Edyth Boone - This festival opener documents the struggles of one sprightly septuagenarian who paints murals on the walls of her Bay Area community, bringing joy to everyone she meets. Particularly touching about her resilience is the fact that Edyth’s nephew was Eric Garner, the black victim of a needless chokehold death at the hands of the police. Edyth’s advice: “You can’t change your beginning but you can put a beautiful ending to the story.” Director Marlene (Mo) Morris has done a seamless job in tying up the multicolored strings of this amazing woman’s life. Acceptance: This 11-minute film presents us with the reunion of two sisters following one girl’s two-year absence in a drug rehab center. The younger sister, overjoyed at this homecoming, tries to piece together through journals and tchotchkes the life they shared, but to no avail. This sensitively wrought story by filmmaker Shelby Hougu contains enough emotional fireworks for a feature length film and deserves a bigger canvas. Dryads: This is a coming-of-age tale from Norway that succeeds mostly because of the two winning performances by the female leads. Hilde is a 15-year-old girl who becomes enamored with Henrietta, the seductive, self-centered lead singer of the Dryads. When Hilde’s nascent talents as a photographer give her entrée into this music-obsessed world, she must learn just how many growing pains she can endure. The on-again, off-again musical score is meant as a showcase for the band’s members but it’s the story-line that wins. Transient: Franky is a likable, ambitious young man, with dreams of becoming a product designer. He’s also an illegal immigrant, brought to the U.S. by his mother as a young boy from Durazo, Mexico. When he is deported through no fault of his own, he looks up his father, soon finding himself caught between two worlds and facing new dangers returning to the only country he knows. Writer/Director Alexander Stockton has created a timely and heartbreaking film. His stated desire is to “make films about how much control someone can have over their own lives.” It’s a brave work, deserving of distribution, especially in today’s climate. But he has “blind confidence”—an important trait for making stories in the dark. Sandra Bertrand is Highbrow Magazine’s chief art critic. Excellent! Would love to have a good chat with you!